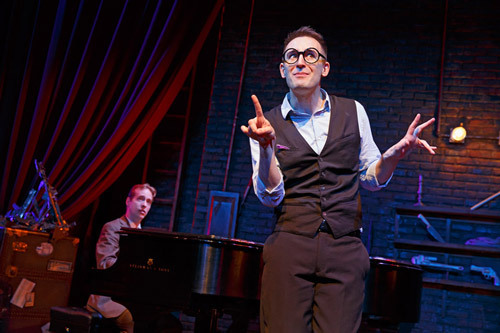 Joe Kinosian (at piano keyboard) and Ian Lowe in "Murder for Two"
“Murder for Two” is a freewheeling, raucous ride not unlike the thrill of a downhill soapbox derby tempered by the sudden realization that your race car really could use a good set of brakes. A two-person whodunit, there’s murder afoul when novelist Arthur Whitney, anticipating a birthday party in his honor, is plugged while walking through the door of a grand manor. All the guests have a bone to pick with Whitney, who has exposed their darkest secrets as plot lines in his best-selling books. Enter Marcus (Ian Lowe), a lowly police officer who sees an opportunity to land a promotion to detective if he can solve the crime before the real detectives arrive on scene. Playing all 10 suspects is Joe Kinosian, who wrote the music as well as co-wrote the “Murder for Two” book. The production is less a musical story than vaudeville tag team with sight gags and slapstick punctuated by music and song. Lowe and Kinosian have enormous talent as pianists and comics. They are also clearly having the time of their lives, so much so that one gets the impression these showmen would spend 90 minutes on stage every night performing this act even if there weren’t an audience in the house. There is an audience, however, and it is often overwhelmed as Kinosian manically changes character from the resentful widow to a prima ballerina to a bickering married couple to Whitney’s niece — a college student whose thesis is how to solve a small-town murder — to a blabbermouth psychiatrist to three tough-talking, pint-size members of a boys’ choir. With new personas distinguished by little more than the donning of eyeglasses, the addition of a feather boa or the shifting of a baseball cap, more props and a scorecard would have helped. The best moments come the few times the actors engage directly with the audience. For example, a cell phone in the policeman’s pocket rings but Kinosian berates the audience for its bad manners. This joke repeats itself twice more; each time managing to get sidesplitting funnier as Kinosian escalates his treats to the gallery. Director Scott Schwartz has his hands full reigning in these two. There’s only so much you can do with a runaway train. By the end of the evening, Lowe and Kinosian might not be exhausted, but the audience is.